Starting with Lee Piercy winning his AG and entire wave in the world duathlon champs. Lee has been suffering with plantar fasciitis and done little running in the last 9 months so this result was a really welcome surprise for him. 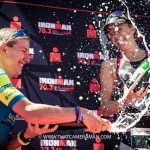 Following on from her victory at the inaugural Ironman 70.3 in Finland last weekend, Kimberley Halton Farrow was taking part in her second 70.3 in a week in Sweden. Could she match England’s football victory and bring it home? A stonking bike split (again!) and course record, she gave it everything but was just pipped to second place by local Lisa Norden. Kimberley will be racing at Challenge Prague at the end of July and will be slipping a 100 mile time trial in before then, so watch this space for her progress. 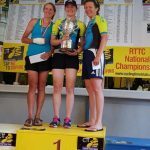 The big event for the team this weekend was the National 100. With the 50 mile champs being cancelled due to road works, the team were keen to get out and get going. 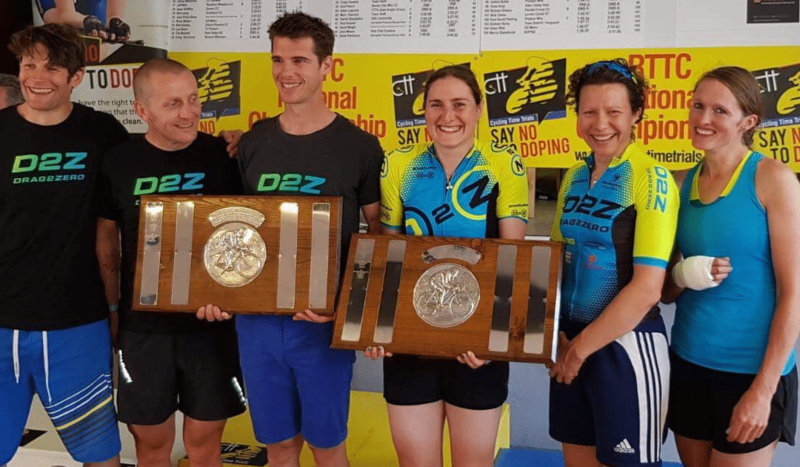 Both Alice Lethbridge and Kieron Davies were defending their national champs crowns, and with a good turn out from the rest of the team we were hopeful for some decent results and we were not disappointed. Gold, silver and bronze medals for Alice, Vicky and Liz was an amazing result, totally blown away by that. It was only later we learnt that Vicky had been hit by a van 40 miles in and managed to still post a great time (pictures on her Instagram are not for the squeamish!). Kieron knew going into the race that he had some tough competition, especially as ex pro Marcin Bialoblocki was participating. He also knew that he could make the 8 hour trip to the Lake District and be called home at any moment as his wife is expecting their second child with a due date of 7th July! Kieron gave it his all and posted an inspiring time of 3.23.03 to take 2nd place – much closer to the winner than he had anticipated. His race report is below. Special thanks to Liv for giving him a pass out! Alan Murchison and Chris Goodfellow posted times to grab the fastest men’s team prize – so happy faces all round! We are so proud of all of our team – they have busy lives and careers outside of riding their bikes, but they always represent us in the best possible way and most importantly enjoy what they do. Well done all! The National 100 took part in the beautiful setting of Cumbria, the course running from Keswick to Cockermouth. Fantastic scenery with mountains and lakes and great weather which made riders appreciate how beautiful our country really is. Its safe to say I saw none of this when taking part in the race, just good old smooth tarmac. This course is certainly not a flat drag strip, an honest rolling course and riders who clocked fast times really deserved them. I was fortunate to win this title last year, the field of riders taking part in this event was incredibly strong, especially with the inclusion of Marcin Bialoblocki. A former polish TT champion, one of the best in the world at this discipline and who is getting himself ready to try and medal in the European TT and World TT championships this year. It’s a privilege to race against him and an amazing challenge as he’s been beating everyone in the country by 3 minutes over 25 miles! So if anyone gets within 12-15 minutes of him over 100 miles, chapeau! I’ve been getting my body ready for this event. I had responded well from the 12 hour TT championships and have been in good form. However, I wasn’t sure if I was going to ride. Our child’s due date was Saturday, but Olivia kept him in and told me to ride my bike fast and get home quickly! Truck loaded, hotel booked last second and Dad to drive all the way up, run like a lunatic to pass on the bottles and drive back ( 8 hour drive one way) SIMPLES! 100 mile time trials hurt. You have to be so disciplined, riding to the limit but making sure that you constantly hydrate, otherwise from the 70 mile mark the body can completely blow and that last part of the ride is agonising. I took on 5 water bottles during the race which delayed the onset of cramp until I crossed the line. Result. The goals were simple, stay aero, ride the long drags hard and drink constantly over the four 25 mile laps. My coach Bob Tobin set a time of 3:30:00 for the event but I knew with the help from Simon and Natalie at Drag2Zero with my best aero set up I could beat it. Being last off has some advantages, I could see that I was catching and making ground up on nearly all the riders and when coming to the finishing straight I could see Adam Duggleby, a national champion, Olympic gold medalist guide rider 20 seconds in front I knew I had given my all. It was second for me, but the gap between Marcin and I was much closer than anyone would have bet on! So I tried to defend the title with some honour and pride. I hope to have the opportunity to try and win it back. My team Drag2Zero did amazingly well at this event. The girls won the team prize and took all the podium places. Awesome work Alice, Vicki and Kim! Alan, Chris and I also managed to win the team prize of the fastest three riders. A good day in the office. This result has helped me towards the British Best All Rounder competition so time to try and clock a good 50 TT. Thank you to everyone who supports me. Now I’m just looking forward to the arrival of our second son and looking forward to putting my focus on the most important people in my life. Thanks for taking the time to read.